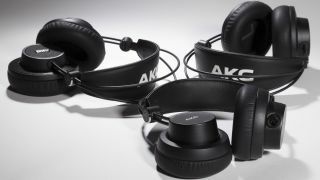 AKG releases K175, K245, K275 foldable studio headphones | What Hi-Fi? AKG has three new pairs of headphones aimed at musicians and audio professionals, but also ideal for anyone who wants a closed-back, over-ear headphone with a durable, foldable design. And who, presumably, prefers the accurate, transparent sound normally aspired to by 'studio' headphones and speakers. There are three new models; the AKG K175 (£109/$129), K245 (£129/$149) and K275 (£149/$169). All three feature a three-axis, all-metal hinge - all critical parts of the design are said to be metal - which allows them to be folded-up. They have a "self-adjusting" headband, floating ear cups with foam ear pads, and a replaceable cable. The K275 and K245 models feature large, 50mm transducers for greater low-frequency extension. The K275 are a closed-back design, while the K245 are open-back, and they offer slightly different frequency ranges as a result. The closed-back K175 earphones meanwhile use 40mm transducers, have a higher sensitivity and a slightly narrower claimed frequency range. Having been in the pipeline for some time, we can only assume AKG's testing regimen, which includes "extreme drop tests" and "an 80,000-bend-cycle test" for the cable, slowed things down a touch. Maybe the $8 billion acquisition of AKG's parent company, Harman International, by Samsung, also caused the company to take stock. Nevertheless, all three pairs of AKG headphones are on sale now.